In all farming operations a good spraying program is essential to achieve a successful crop. If weeds, fungus and pests are left unmanaged, it will have a detrimental effect on your crop. Plant health will be poor and growth vigour will be hampered, which all will lead to a plant which is incapable of producing a yield. The South African climate is very favourable for the reproduction of pests. Each year with the onset of the rainy season a multitude of crop pests are hatched out, all looking for a food source to consume in order to reproduce the next generation of pests. It is an ugly cycle which can cause catastrophic damage if left unmanaged. 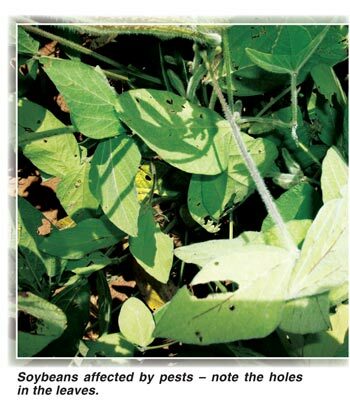 Soybeans as well as many other legumes are especially susceptible to fungus and pests and need special nurturing care in their growing stages. The leaves of the soybean plant are their factory which will provide the energy to produce pods and the seeds to fill the pods. If the leaves are damaged in any way the energy production is hampered which will have an adverse effect on pod filling. Leaves can be damaged in two primary ways, one – fungus and bacterial damage and two – pest damage. This type of damage usually occurs when there are severe wet, humid conditions. The bacteria will lie dormant in the previous year’s crop residues and when conditions become favourable they will develop rapidly. The bacterium is spread by wind and rain. Many fungal diseases can be managed by foliar fungicides. There are however certain bacteria that will not be killed by foliar fungicides as they are caused by bacterial pathogens and not fungus. This is the case with Bacterial Blight and Brown Stem Rot. The best method to reduce the risk of fungus and bacterial damage is to have a good crop rotation program. This will reduce pathogen populations as soybeans are the primary host species. An alternative is to rotate the bean varieties that are planted and in severe cases to plant seed varieties that have proven to have a resistance to bacterial and fungal damage. In many cases where there has been considerable damage it can be advisable to spray a folio feed which is a mixture of chemicals and nutrients which encourage leaf growth. This can assist the affected plants to bounce back and continue growing well. Pests are especially threatening to soybean crops as they can often prove resilient to chemical control. Many of the bacterial issues mentioned above can sometimes be outgrown by the plants and their growth vigour can recover to minimise the damage caused by the bacteria. Pests on the other hand can reproduce in numbers and grow in size causing more damage as they feed on the leaves andpods. This can be seen in the Corn Earworm commonly referred to as the Bollworm which is a prominent pest in the bean world. Bollworms can be identified on the plant by small black balls which are actually their excrement, in the later stages you will notice what is known as shotgun damage. This is many small holes in the leaf where the worms have eaten. If the worms are left unmanaged they will consume the leaves, flowers and also the pods. These worms are physically tiny but can cause huge damage if the population numbers are high. The only way to physically see the worms is to take an A4 white piece of paper, pull out a plant and shake the leaves over the paper. If you look closely you will notice lots of tiny little worms. To control the Bollworms you need to apply a chemical pesticide such as Karate or Prevathon. In most cases a chemical application will need to be repeated to have the best results. Pest control and fungal control both need to be applied with an integrated approach. Firstly, as a farmer you should always have a preventative plan of action. Consult your chemical representative to help you develop a spraying program that will attempt to prevent most fungal and pest risks that may occur during the growing season. Secondly, you should have an action based approach. This will rely on your crop inspection and monitoring duties. As soon as a threat is detected you should develop a plan of action that will actively remove the threat. This method will make use of chemical application measures. Lastly, you need to make use of nature as much as possible. Everything in nature has natural enemies. When planning your spraying program it is suggested that you do research into the products that you will be applying. Try to stay away from products that will destroy helpful insects such as bees and ladybirds. These insects will assist you in achieving a controlled environment in your crop lands and will also assist you to achieve optimum yields. All measures can be taken to try and achieve a good crop and a good yield but ultimately nature can throw obstacles and challenges at us all the time. Therefore it is the responsibility of you as farmer to continually be monitoring and assessing your crops to mitigate any threat that may enter your crop lands.